At last, we have arrived at the time of year when Mother Earth awakens from her slumber, flexes her stiff muscles, and all living things respond to her renewal. The soggy grass breathes as it emerges from under the melting snow as the temperature rises above zero, and birds that winter in the south return to northern skies. Yellowknifers straighten their weary backs as they exchange heavy parkas for light jackets, and men’s faces become recognizable as winter beards are shorn. Toddlers run around parks where previously the snow was too high for them to wade through, and puddles form as the ice cover on the lakes begins to thaw. It’s fitting that Earth Day is in April, and by extension, Earth Week. This year, Ecology North offered several events to celebrate the week around Earth Day. Among them were a lunchtime fish fry outside the Post Office, various nature walks around town, a backyard composting workshop and, for the creative, a workshop on making bat caves and bird houses. 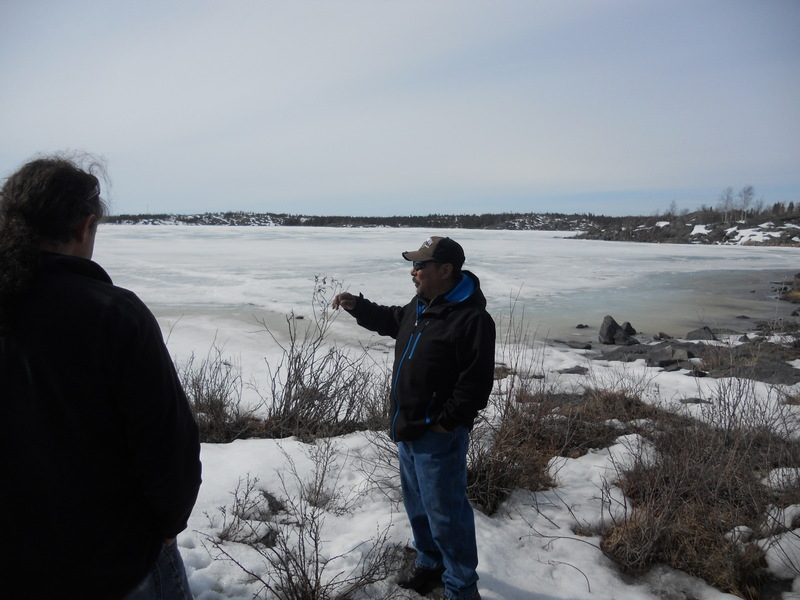 I decided to participate in a traditional knowledge nature walk. I’ve been in Yellowknife for over 2 years, but I feel like a resident tourist, because there’s always something interesting to discover. The walking group assembled at the musem, where we met our guide and local wildlife expert Fred Sangris, a.k.a. Caribou Dundee, of the Yellowknives Dene nation. We started off by learning that in the days when there were no calendars or watches, the elders predicted the coming of Spring by counting 5 moons from the 1st snow in the Fall. The women would also look for new shoots on the trees, because they had a narrow window of time to stretch out their moose and caribou hides for tanning before the flies arrived. Once it was thought that Spring had indeed arrived, someone would make an announcement to the community. That was the signal that it was time to prepare for the celebratory feast and drum dance, called the Feeding The Fire ceremony. It’s meant to give thanks to the Creator for all of the gifts of the earth, for the renewal of the land, and to welcome the new-born animals to the earth. Different communities celebrate at different times. In Yellowknife it’s held in June, and there’s no town crier anymore, unless you count the Yellowknifer newspaper. Long before there were pharmaceuticals there were trees and plants, so like all aboriginal people, the Dene developed their own native medicine practices. Frozen cranberries – those that remained on the bushes during the Winter – are good for cleansing the blood and stomach. Fred informed us that the birch tree is one of the most important trees for aboriginal people. For one thing, its sap is good for stomach aches, and as a stomach cleanser. I was introduced to birch syrup in Yellowknife, on pancakes and ice cream. I find that it has a strong taste similar to molasses, which, for my palate, doesn’t belong on either pancakes or ice cream. Now I know what else can be done with it. The leaves of the birch tree are also useful. They’re edible, and in a pinch they’ve been known to sustain hunters out on the land who have run out of food. When crumpled and added to water, the liquid can be applied to the skin for an effective mosquito repellent. However, its efficacy is short-lived, as it needs to be re-applied after about an hour. I now have a new natural repellent to try for the upcoming baseball season. I will have to walk with a good supply, because during the Summer, mosquitoes in Yellowknife are notoriously plentiful and persistent. That’s probably due to them having their choice of bodies of water in which to lay eggs. 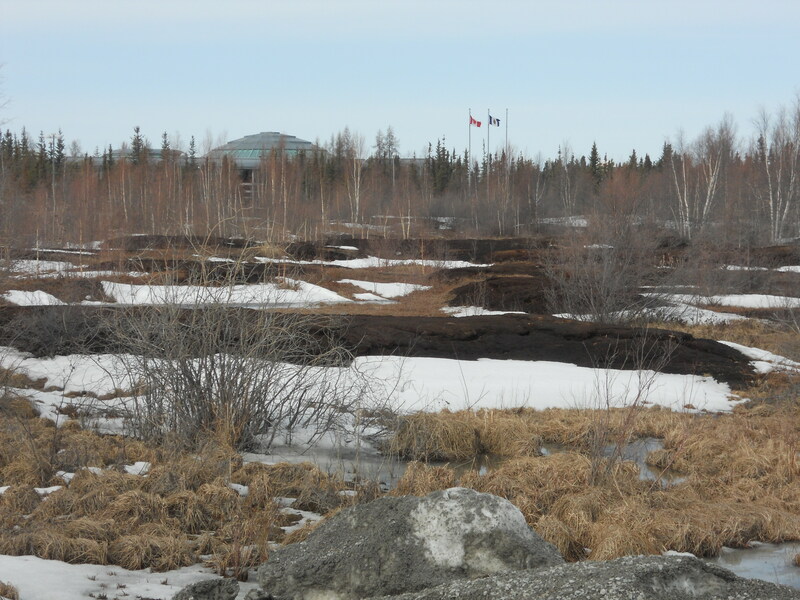 Between the museum and the Legislative Assembly building, there’s an area where poor drainage and melting snow have created a type of bog, called a muskeg (from the Cree word maskek, meaning low-lying marsh). It was semi-frozen that day, but in warmer times it’s a haunt for frogs. We learned that there’s a species of tiny frog that freezes during the Winter and thaws out and comes back to life in the Spring. I’ve always thought that the ability of animals to hibernate put humans to shame. Little did I know that there were creatures practising cryogenics, without any of the fancy equipment that makes it so complicated and expensive for us humans. There were thick brown carpets of moss dominating the muskeg. Long ago, women harvested this moss, dried it over a wood stove and used it to make the original organic, disposable diapers, courtesy of Mother Earth. 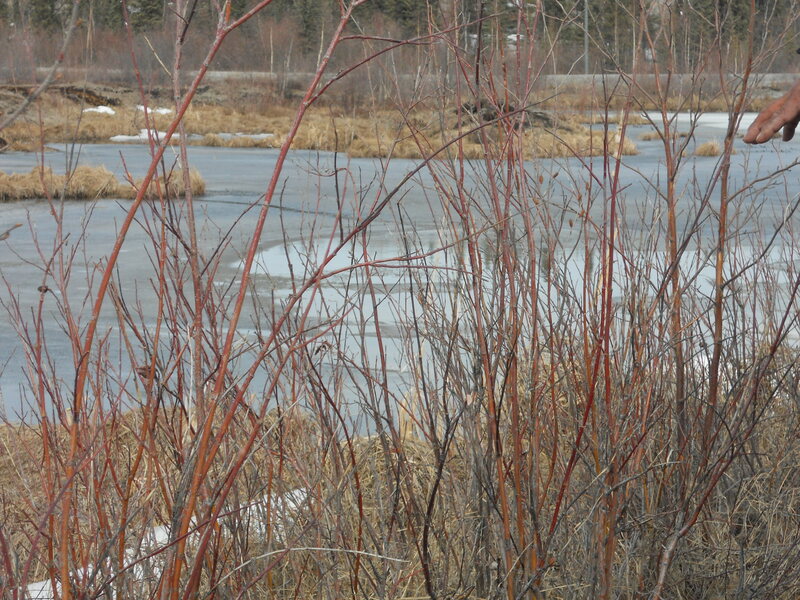 Before there was the Hudson’s Bay Company and the North West Company selling twine, red willow reeds were used to make fish nets. They had to be kept soaked in water all the time, but they lasted a long time. 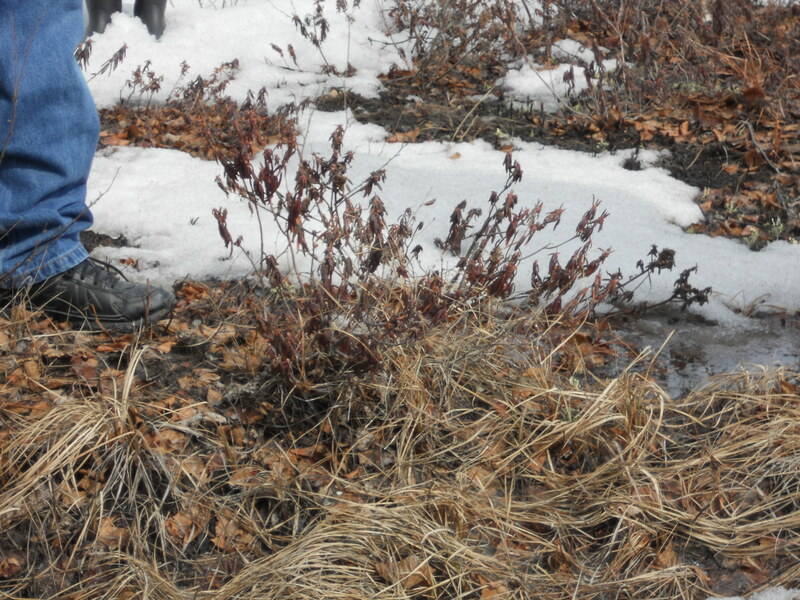 Also in the muskeg we found some Labrador bushes, looking dry and weary from Winter. The leaves are used to make Labrador tea, which Fred swears will keep you young. Evidently his grandfather drank it non-stop and lived to see 120 years of age. The leaves are best harvested around July. Animals are of critical importance in aboriginal culture, where hunting for food is an integral activity, hence Fred’s nickname of Caribou Dundee. Typically, caribou are born in June. Fred recalled being with a herd during the birthing season and noting that all of the calves were born within a period of 3 days. New to me was the fact that caribou cows lose their antlers after giving birth. People harvest the antlers that they leave behind. The straighter ones are fused over fire to make bows for hunting muskox. 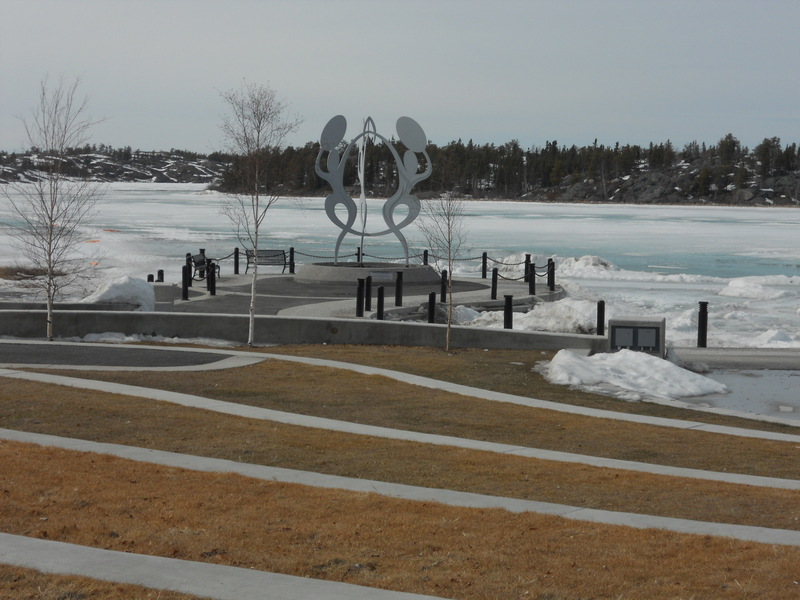 Due to environmental changes, there are now creatures around Yellowknife that were not here previously. Within the past 10 years or so, cougars have moved into the bush outside of town. It’s thought that heavy logging and industrial activities down south caused this migration. I’ve heard lots of talk of encounters with bears and even some with wolves, but this was the first I’d heard of cougars. Evidently they’re not to be feared, because they’re afraid of people so they run away…thus far. Birds are plentiful during the Spring and Summer, and some of the islands in the Great Slave Lake are de facto bird colonies, with a cacophony of bird calls and squabbling noises. The sight of a robin is commonly known as a sign of Spring, and one of the aboriginal stories is that the robin used to be a person, a proud hunter, who did something to displease the gods. He was turned into a bird that would be recognized by everyone, hence the red chest that makes him stand out, and the distinctly recognizable song. Fred mentioned that due to global warming, the Winters in recent years have been warmer than usual, which is why foreign species of birds have moved to the area. If -40C is considered warmer than normal, then I’m grateful for global warming, because I too am one of those foreign creatures who couldn’t live in Yellowknife without it.